And the history of the Onderwijzer family of Amsterdam and other Towns in Holland. Chief Rabbi Onderwijzer was born on July 24th, 1862 in the small town of Muiden, not far from Amsterdam. When he was eleven years old he moved with his family to Amsterdam, as it was difficult to lead a Jewish life in a small town, where they were the only Jewish family. His father also preferred him to start his studies at the Dutch-Israelite Seminary, at that time headed by Chief Rabbi J.H. Duenner. His father had asked him to continue the family tradition of some two hundred years to become Talmudic scholars and Rabbis, but at that time there was great prosperity in the diamond industry and pressure was put on him to enter this trade, as he himself used to tell. Since the establishment of the Ashkenazi congregation in Amsterdam he was the first Chief Rabbi of a native Dutch-Jewish family holding this post, who had not come from a foreign European congregation as was customary until then. In 1884 he graduated with highest honors and received his degree in classic literature from the University of Amsterdam and in September 1886 at the age of twenty-four he also received with highest honors the title of Rabbi and was called "Moreh". From 1882 to 1888 he taught at one of the schools for Jewish Religion belonging to the Jewish Community in Amsterdam. On August 1st, 1888 he started his duties as Rabbi of the Main Ashkenazi Synagogue in Amsterdam. On March 11th, 1917 he was chosen Chief Rabbi of the Jewish Ashkenazi Community of Amsterdam and North Holland, to which also belonged important congregations such as Bussum, Hilversum, Haarlem and Den Helder. About the Onderwijzer family details are known to us from 1699 and onwards. The earliest source of information about this family known is the Municipal Register of Amsterdam. It starts with Naftalie Hertz Schamasch Katz who died on September 1st, 1699. It is assumed that the family originates from North Germany, district Schleswig-Holstein. The double family name Schamasch-Katz shows that during the first generations of this family, they held the function of schamasch (caretaker) in the synagogue. In those days that was an honorable and prominent function as is also apparent from several records of the Ashkenazi Community in Amsterdam. The last part of the above list of family names shows that members of this family were Cohanim (priests). This had special meaning with respect to Abraham Samson Onderwijzer, the Chief Rabbi, when he together with his five sons (one of whom, Elias Hijman was the father of the author of this piece) stepped onto the podium during the Holidays in order to give the Priests' Blessing. In Holland it was well-known that from the third generation onwards a long line of scholars, wise men, rabbis as well as rabbinical judges (dayanim) came from this family. This was documented in a letter written by Abraham ben Josef Hacohen Onderwijzer, grandfather of Chief Rabbi Abraham Samson. He was the first one who used the family name of Onderwijzer, which was probably chosen by his father in the beginning of the 19th century according to the decree by the Napoleonic regime 'to assume a name'. Choosing this name and its meaning indicates that many members of this family were teachers and rabbis and that they had chosen their profession and vocation as their family name. Many other Jews had done the same. "They were all "יושבי על מדין", sitting on a judges' bench like a commission of wise men, in the Ashkenazi school, here in the city of Amsterdam "יע"א. The scholarship of this family was already known in the community of Amsterdam in the 18th century. Abraham Cohen was also the first pre-eminent and undisputed Chazan in the family. That is why he added the name Chazan to his name and thus he became known as Abraham Chazan, teacher and chazan at the synagogue of Blokzijl, a small town in Overijssel – before he moved to Amsterdam. On the 3rd of Elloel 5587, August 26th, 1827, after having held a trial service for the position of chazan at the Main Synagogue and at the "Neije Sjoel" in Amsterdam, he was chosen by a great majority out of eight candidates. We find this described in detail in a publication issued in 1927 on the occasion of the 100th anniversary of the nomination of Abraham Cohen Chazan as chazan at the Main Synagogue in Amsterdam. He carried out this honorable function for forty two years to the complete satisfaction of his audience, as mentioned in this document, and his talent was inherited by the following generations of his family. Two sons of Chief Rabbi Onderwijzer served as chazan; Maurits served as chazan in Utrecht and Eli, Elias Hijman was chazan during the High Holidays in the synagogue in the Lange Houtstraat in Amsterdam, as well as on other occasions, upon request. Five of his grandchildren, the sons of two of his daughters who live in Israel – thus the great grandsons of the Chief Rabb, also often serve as chazan in their congregations. Little Abraham Samson Onderwijzer, the grandson (of his son Izak) of the Chief Rabbi was known during his short life for his exceptional musical sense and talent. He was only six years old when he was taken away and led to his death together with his parents and all other children at the orphanage that his father managed. "Emoenath Omen" (אמונת אומן) by Rabbi Uri ben Joseph Cohen Onderwijzer, in which among others it says: "….Explanations on some articles of "our scholars", on the holy script and of the foundations of the Jewish religion, to which the Jews are prepared, and our belief in Jacob's house which is stamped therein' --- explanations of articles of scholars and of the basis of the religion. The second book "Mat'amei Jitzchak" (מטעמי יצחק) written by Isak ben Leb-Jehuda van Gelder of Muiden, one of the forefathers on his mother's side, which deals with new insights into certain questions of the Talmud, Rashi explanations and complementary comments on these. The most prominent of the scholars in the Onderwijzer family was undoubtedly Chief Rabbi Abraham Samson Onderwijzer himself who dedicated fifty years to the community in Amsterdam, from the day in 1882 when he started as a teacher at Jewish schools (in Amsterdam) until his death in November 1934 (Kislev 5695). His period as Chief Rabbi of Amsterdam and its surroundings. In 1911 after the demise of Chief Rabbi Duenner z.l. (of blessed memory), Rabbi Abraham Samson Onderwijzer together with Rabbi Joel Vredenberg were appointed Acting Chief Rabbis, and in 1917 Onderwijzer was appointed Chief Rabbi of Amsterdam and North Holland. One of the great problems occupying the Rabbis of that period was the growth of Reform movement within Dutch Jewry. Though during the period of Chief Rabbi Duenner the Reform movement did not succeed in getting off the ground, but in the thirties of the previous century the "Liberal Union of the Jewish Faith" was established, against whom Chief Rabbi Onderwijzer, heading the "Rabbinical Council" started a dispute. Although the Reform Community was no match against the big community, they nevertheless succeeded in striking root. Josef Onderwijzer, the son of Chief Rabbi Abraham Samson, wrote that this was at the time the greatest worry of his father, the Rabbi. During that period the problem of how to act concerning those Jews who married non-Jewish women caused a lot of controversy as well. In one decision of 1927 the council of Chief Rabbis tried to prevent the community rabbis to choose a person not married to a Jewish woman to perform honorable tasks in the community and/or to be called up to the Tora. This statement, known as the "Rabbis' Letter" caused a big uproar in Dutch Jewry and was mentioned in the Jewish as well as in the general press, but was rejected by most circles. On January 17th, 1928 a discussion took place between the Chief Rabbi and Council of the Jewish Community during which the Chief Rabbi pointed out the state of affairs as a result of the mixed marriages which to his mind was devastating. He mentioned that during that year in Rotterdam 50% of the marriages were mixed and in Amsterdam 20%. He considered this situation a reason to threaten with his resignation. The matter ended in compromise, namely a statement in which the Council recognized the Rabbi's right to express his disapproval, but he did not succeed in getting their official condemnation of mixed marriages. During the years that Abraham Samson Onderwijzer was Chief Rabbi the city of Amsterdam expanded and accordingly the Jewish population grew in those years to 70,000. With his encouragement and under his leadership Jewish centers were built in the new areas/quarters, such as "Nachliel" (נחליאל) in the Eastern part of the city and "Shalom weree'oeth" (שלום ורעות) in the North, as well as in the South and West. New synagogues were established on the Jacob Obrecht Place and Lek Street. In these quarters a lively Jewish life developed which also led to the opening of youth synagogues. One of the most important events in his career was the royal visit of Queen Wilhelmina, Prince Hendrik and Princess Juliana to the Great Synagogue on April 1st, 1924. Queen Wilhelmina reacted to the speech of the Rabbi as follows: "Your words have touched me to the depth of my heart". Rabbi Simon Dasberg who was present at this festive occasion, said when he came home: "She was not the Queen, he was the King". Several Royal Orders were bestowed upon Chief Rabbi Onderwijzer, among others: "Knight of the Order of the Dutch Lion" and "Officer in the Order of Orange-Nassau". As from the twenties in the 20th century, Zionism in the Netherlands became ever stronger and Chief Rabbi Onderwijzer, although he belonged to the Aguda – a movement which in those days was in principle against Zionism – contributed a conciliatory factor between the two opposing movements i.e. the Aguda and the Zionists. On January 15th, 1925 there was a meeting between Chief Rabbi Onderwijzer and Prof. Chaim Weizman, President of the Zionist World Organisation. In reply to the questions of the Chief Rabbi, Weizman stated that while establishing Erets Israel the Zionist leadership will do nothing that will be in conflict with the "Halacha", the Jewish religious laws, as accepted by the Chief Rabbi. In August 1923 the Chief Rabbi was named representative in a campaign to give traditional Chalutsim (pioneers) advance training, in cooperation with "Agudath Jisrael" and "Mizrachi", the religious- Zionist movement. In 1929 the Jewish Agency הסוכנות היהודית was established by Prof. Weizman heralding the development of the Zionist organization, which would from then on include Zionists as well as non-Zionists. Chief Rabbi Onderwijzer was strongly against the intention to include non Zionist agencies, mainly communities, in the non Zionist part of this new organization. Supposedly he saw in the Jewish Agency a camouflaged form of Zionist rule, which would be dangerous to Judaism, a tendency that should be stopped at any cost. , the "Knesia Hagedola" "הכנסיה הגדולה" (the Great Meeting) of Agudath Israel in Vienna, the point of view of Jakob Rosenheim, chairman of Agudath Israel was accepted against the affiliation. Therefore, Rabbi Onderwijzer as Chief Rabbi could not agree to the affiliation of the Dutch Community to the Jewish Agency. Although he was chairman, his proposal to the "Council of Rabbis" against agreement was not accepted and the general conference of the Council of Rabbis named its delegates to the Jewish Agency. His relation to the "Mizrachi" Movement. Nevertheless he was not reckoned among the opponents of the "Mizrachi" movement. "He, the Rabbi, was not a Mizrachi man and did not belong to our ranks. Nevertheless he also did not belong to our opponents. He was able to understand and honor the ideas/concepts of his fellow men and was able to put himself in their place. The members of Mizrachi worked with him in full cooperation with mutual respect and appreciation and in sincere friendship." 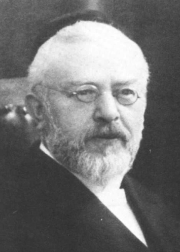 As an "Agudist" and member of the Dutch "Agudath Israel" he took part as the Dutch representative in the first "Knesia Hagedola" of Agudath Israel in Vienna in 1923. There he met great Tora scholars like Rabbi Israel Meir Hacohen, the "Chofetz Chaim" and Rabbi Chaim Ozer Grodz'inski of Vilna. The decision taken there to support only institutions and Jeshivoth, where only Jewish studies would be learned, without any non-religious courses, caused bitterness in the Dutch Jewry and dampened their sympathy for Agudath Jisrael. Chief Rabbi Onderwijzer indeed resigned from the Dutch section of Agudath Jisrael 'because of serious complaints". He probably joined them again at a later stage, but no clear information is available. The work for which Chief Rabbi Onderwijzer was most known was without a doubt his Dutch translation of the five books of Mozes (the Tora) together with the translation of Raschi – explanations of the Old Testament (Pentateuch). For this he envisioned an as true as possible – for the layman understandable - translation of the bible. This work was completed in 1901 with the edition of the last part (דברים) Deuteronomy.At the head of the list of subscribers appears the name of Queen Wilhelmina. For the translation of the Raschi-explanations, the Rabbi used the scholarly publication of Raschi, a work by Dr. A. Berliner from 1866. He also wrote a comprehensive article about the life and work of Raschi, which was added to the last volume, Deuteronomy. Prof. Gans wrote about this work in the "Memorbook" "that this is probably the most important monument which Dutch Jewry of before the war has left". After the Second World War a new edition was published after all books had been sold. All five volumes of this Pentateuch, this חומש can be found in the Hebrew National Library in Jerusalem. The Rabbi also wrote a knowledgeable article about the subject: "A few remarks on בנין אב " which appeared in the jubilee book on the occasion of the 70th birthday of Rector L. Wagenaar. There also have been kept several publications of "questions and answers" (שאלות ותשובות), two of which are kept in the Rosenthaliana Library at the University of Amsterdam. In the opinion of Rabbi Schuster z.l. who wrote an extensive article about the personality and work of Chief Rabbi Onderwijzer, these are "questions and answers" of a wise Talmud scholar, who quotes citations of the "first and last" scholars, builds his answers systematically and formulates them in clear Hebrew. Also found in the literary inheritance of the Rabbi are observations on the subject of religious laws such as a Shabath-timer (שעון שבת), divorce, money and law regulations, fraud and invalid purchase, the right to strike, etc. The latter subject shows us his attitude to social care, the care for the fate of the Jewish laborer. All these works are in the library of the Center for Research of Dutch Jewry in Jerusalem and with the author of this article. His activities in the domain of instruction and education. The Rabbi gave on Saturdays in the Great Synagogue about forty lessons based on complicated Talmud discourses which required good preparation by the participants. Therefore, the subject of the lesson was announced beforehand in the Jewish newspaper. During the week at the seminary and also on courses and at lesson meetings, as well as individually, people started to study the material in order to be properly prepared for the lesson. Rabbi Onderwijzer was teacher at the Seminary for Rabbis and chairman of the Council of Rabbis who tested the competence of the learning orators and Rabbis. He taught from the מדרש רבה, the 'Great Midrash' and was proficient in legends and tales of the Rabbinical literature. At the beginning of his career he also taught small children, he was an exceptionally good teacher and loved children and they loved him too. He had a heart/feeling for Jewish lessons. He was treasurer of the society of Jewish schools "Knowledge and Devotion", an association that has established primary and secondary schools as well as a school for higher education named the Herman Elte and the Palache schools (primary schools), two secondary schools and one Talmud Tora. On his initiative and in order to keep Jewish youth far from the dangers of the streets, a club was organized for more than a thousand kids, the "Beth Yisrael", as well as a resort for recreation and vacation for weak children, the "Bosch-kolonie". Also, as a reaction to the establishment of the socialist General Dutch Diamond Workers Association in 1894, the Society of Israelite Laborers and Trade Employees "Betsalel" was organized about a year later, on his initiative. In this way the Rabbi tried to organize the Jewish laborers. The description: "the minister for peace" and "a conciliatory person" as he was described by the Jewish reporter of the important newspaper "Het Algemeen Handelsblad", would suit him well. Although he was a Cohen (priest) (for whom it is not allowed to be in cemeteries) he was offered the honorary membership in the funereal society "חברה קדישה", with his appointment to Chief Rabbi. He had good relations with the Portuguese-Sephardy Rabbi, Chacham Dr. Ricardo and also with Rabbi Simon de Vries, mentioned above, who was one of the Mizrachi Rabbis in Holland. Chief Rabbi Onderwijzer died on Shabbath, 10 Kislew 5695 – November 17th, 1934, at the age of 72. Rabbi Sarlouis was appointed his successor. He was spared the tribulations of the Jews in the Shoah which affected his family very much and which destroyed his beautiful congregation. Of his 13 grandchildren only 7 granddaughters were left and they continued the family dynasty and its religious life. Almost all his descendants nowadays live in Israel. 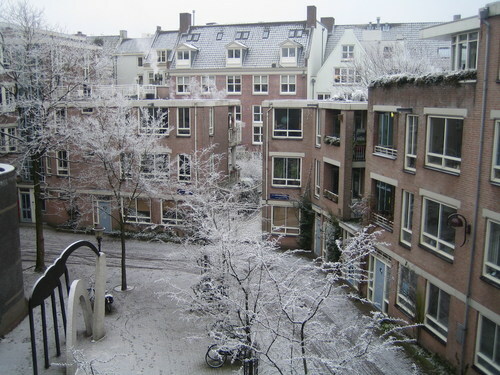 On Chanuka 5748 – December 1984 a street was named after him at the initiative of the Amsterdam municipality: the A.S. Onderwijzerhof, next to the Great Synagogue where he held the function of Rabbi during 46 years. Yudith Ilan-Onderwijzer, Lea Sonnenshein-Onderwijzer and Ben Noach. Copyright © 2006-2010, Amoetat Akevoth (Traces) registered amoeta in Israel. All Rights Reserved.